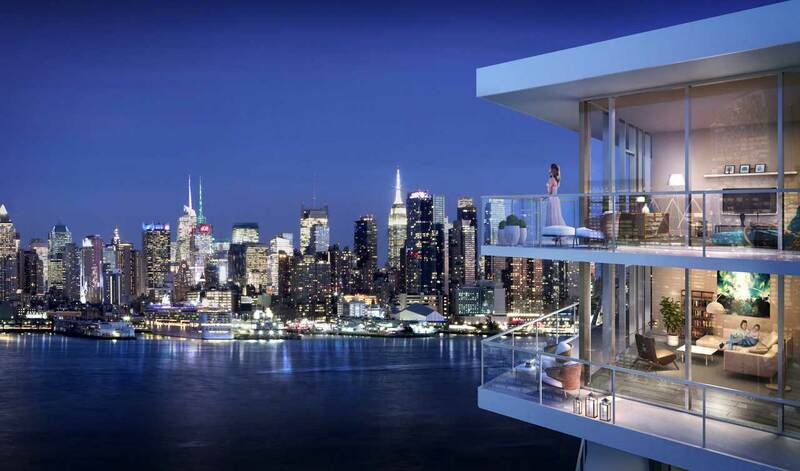 The final phase of Lennar’s acclaimed Henley on Hudson waterfront condominium community on the Weehawken, NJ waterfront has drawn considerable buyer interest, with 60% of the first building already sold. With vertical construction of the building now completed and initial move-ins scheduled for this fall, Lennar has released the second and final building for sale. The new collection of 67 residences brings to a close the 201-home community nestled along the Hudson River with spectacular views of the midtown Manhattan skyline. New buyers at Henley on Hudson will enjoy the added benefit of living in a completed, allowing them to enjoy the scenic setting from their outdoor balconies, terraces and waterfront promenade with little distraction. The newly-designed residences at Henley on Hudson are priced from $799,000 to $2.5 million and feature one-, two- and three-bedroom floorplans ranging in size from 1,165 to 1,998 square feet of living space. Most of the single-level designs offer balconies or terraces to maximize the community’s dramatic views. The homes are situated in two buildings of four and six stories above a private parking garage. Homeowners will also enjoy private amenities including a cardio fitness room, children’s playroom, lobby lounge and an outdoor garden terrace. In addition, residents will have access to the Club at Henley, a private 6,000 square-foot clubhouse with a club room, theater room, billiards and gaming lounge, state-of-the-art fitness center, Yoga/Pilates room, children’s play studio and an outdoor, resort-style infinity pool. Situated within Port Imperial, the 200-acre mixed-use community that stretches two miles along the Hudson River, Henley on Hudson takes full advantage of its vibrant waterfront setting. The location is particularly convenient for commuters as the Port Imperial ferry terminal with service to midtown and downtown Manhattan and Light Rail station connecting to neighboring Hoboken and Jersey City are nearby. The Lincoln Tunnel and several major highways are just minutes away. Port Imperial also features a waterfront walkway system and several parks just outside residents’ front door. The nearby Shops at Riverwalk offers a dynamic and animated riverfront destination featuring numerous dining and shopping conveniences.